Today I will be posting a simple Thali which we relish in Tamil Nadu. Sambar is the famous lentil based gravy from south India. Each house in the state has a special recipe for sambar. I prepare it like my mom. The sambar powder she makes is very simple yet delicious and at my in-law’s place every one likes the sambar which I prepare. I also prepared poondu rasam, appalam, carrot poriyal and chenaikilangu varuval to go with it. The usual lunch is not complete with out curd and pickle. I have served ginger pickle for curd rice. 1. Soak tamarind in 1 cup of water. 2. After 10minutes, extract the thick juice out of tamarind. 3. Add some more water to the tamarind and extract second juice from it. 4. Discard pulp. In remaining water, crush tomato until mushy. 5. Add it to the tamarind water. 7. Heat oil in a pan and add cumin, mustard, urad dhal, methi seeds and asafoetida. 8. When they crackle add curry leaves and broken red chillies. 9. Add the tamarind water and let it heat until frothy. Do not allow the mixture to boil. 10. In a serving bowl, add salt and coriander leaves. Pour the frothy rasam on top and cover with lid. 11. Serve it hot with rice after 5 minutes. 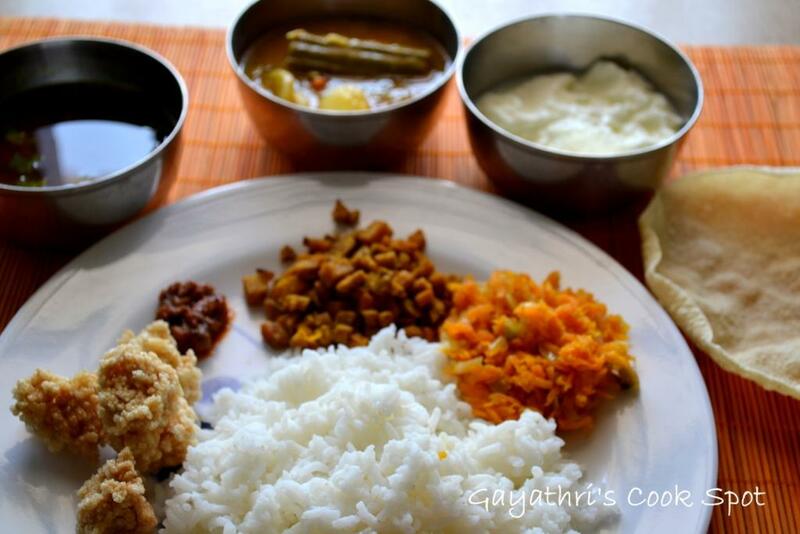 Am inviting myself to ur place Gayathri,am missing all these delicious foods.. Very nice thali. I especially was interested in Aval vadagam. Sounds easy compared to traditional rice grinding. Isn’t it? That’s a great looking thali Gayathri!..wonderful spread! Beautiful spread. I wonder if you could share the recipe for Aval vadagam. 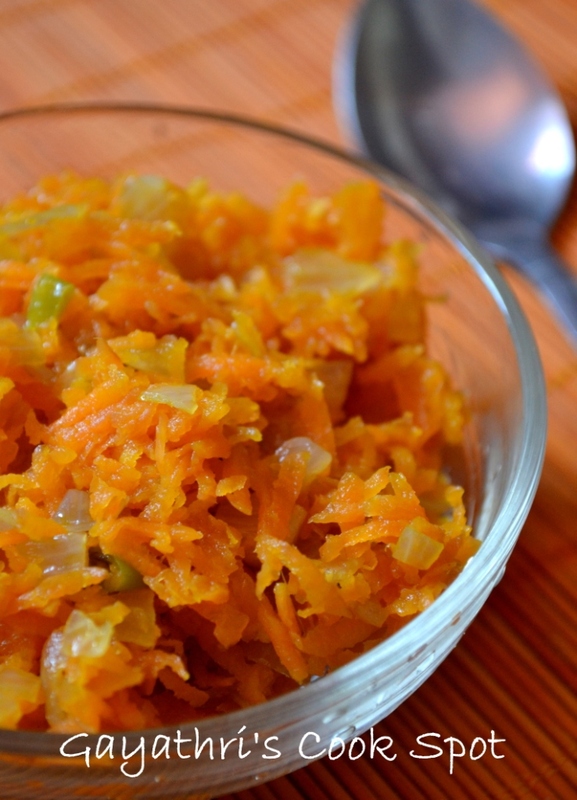 I am sure I can make use of the recipe this summer! Harini, I have provided the link in the post itself. Yummy thali ..everything looks so delicious. Such a scrumptious spread, can I come over?!! Today every post is tormenting me. A simple south Indian meal, that is what we enjoy. But my eyes zoned in on the Chenai. 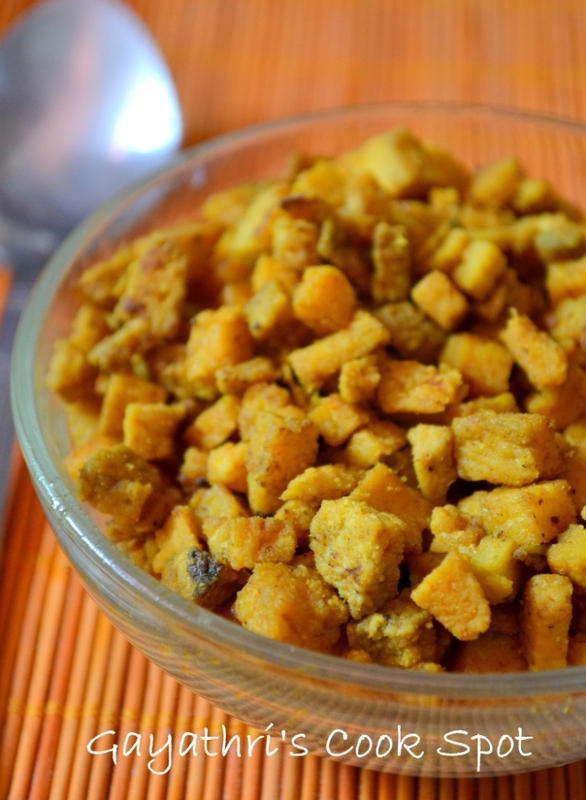 I love Chenai and yours looks perfect like the way amma cooks it. I hope you take a bite of it for me next time you make it. Such an awesome post. Thanks for sharing and making me feel nostalgic. everything looks great..that saambhar looks so nice and filling! Awesome … I am in the middle of reading “Monsoon Diaries” by Shoba Narayan … and this totally fits the bill 🙂 The inji curry yummy … !! lovely feast… loved the aval vadagam ! Beautiful spread…. if this is simple thali then what will be the lavish thali ? Looks really divine Gayathri. Aval vadagam is something totally new to me…did you make it or is it store bought? Would love to get the recipe for the aval vadagam. Everything looks very tempting. Good one. My mouth is watering just looking at all the items in there! Delicious! 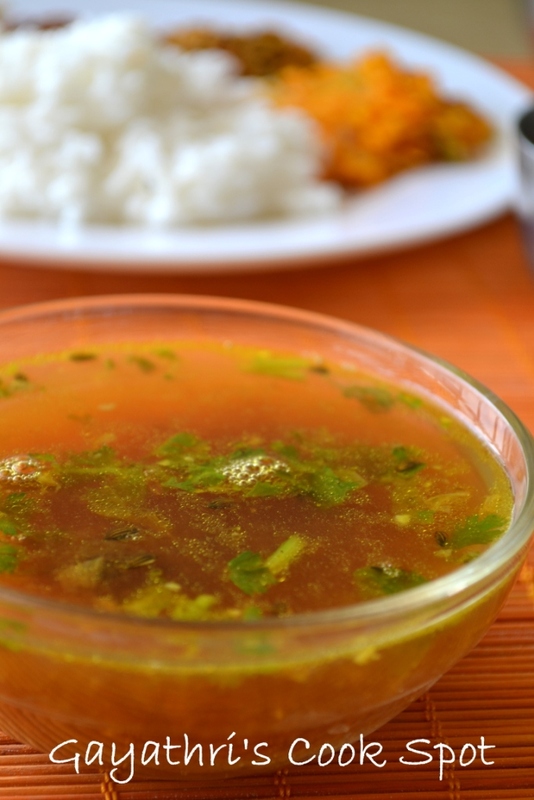 Comfort food at its best.I love poondu rasam with vadagam.Awesome post!!! Yum, love the entire thali.